Click Any Link to leave us a review!! He was able to replace my water heater the same day I called which is a big deal when you have kids! I needed a new water heater. He guided me through the process and helped me decide on the best option to meet the needs of my family. 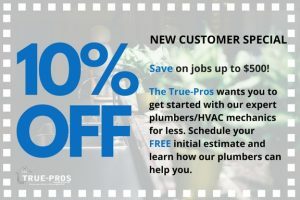 It went great True Pros was amazing and really knowledgeable they informed me of everything before they started and work and made sure I understood the price! True Pros are amazing you can’t go wrong with them. Jon came out quickly and was able to fix everything. He was very nice, professional and knowledgeable. Something that is very important to me is that he didn’t leave a mess. I am very happy to find a good plumber! I could not be happier. The work was done fast, efficiently, and most importantly, correct the first time. I contacted this company and from the initial estimate to the final clean up, I could not be happier. The work was done fast, efficiently, and most importantly, correct the first time. Work progressed as I was told it would and he was extremely knowledgeable and helpful throughout. I would DEFINITELY recommend them again, and I have! Amazing quality of service and punctual! The plumbing in my home was in major disarray and it was very important to have the problem fixed quickly. The punctuality and quality of the work of True Pros was to the highest level and exceeded expectations. I will be calling them for any need in the future! This is the best plumber in Florida!! Knowledgeable, Experienced, Caring, On Time, and I just can’t say enough about “The True Pros”. Thanks Jon! I had a broken washer-line after a remodel in my home. I am pretty handy so I tried fixing it myself but it proved to be a pretty big job. I was in a bind because it was half started, the washer and dryer were in the middle of the hallway, and the water was off. I called True-Pros and they were able to come over quickly. I had an idea that it was going to be a while because a wall needed to be cut and all kinds of stuff. It seemed like 30 minutes passed and he said he was done! I couldn’t believe it. I had another project to re-route the pipes under my kitchen sink due to getting a newer and larger disposal and the old remodel was not done properly and always had a small leak. I was afraid to push my luck with a “favor” but I figured I would give it the ‘Ol “hey since your here” try. He didn’t hesitate to oblige. He poked around to see what he needed and said he’ll be right back. He came back from his van with everything he needed. One trip, fixed it all. Didnt cost all that much. He was professional and courteous. Speaking with him made me feel very comfortable that he wasn’t trying to upsell anything like “hey this pipe is old, you should get a new one while I am down here” and he sounded very knowledgeable. It took a while to write this post, but since I had the work done, no leaks or issues. I will definately use him for another upcoming project.